Fishmarket South as viewed to the northwest from the Humboldt River. The low-rise building at the riverfront is Pier 45. Fishmarket South is a 4-block neighborhood in Algonquin, Liberty City. It is bounded by Fishmarket North to the north (by Emerald Street), Lower Easton to the northwest (by Emerald Street), Chinatown to the west (by Albany Avenue), The Exchange to the southwest (by Albany Avenue, Barium Street and Union Drive East), Castle Gardens to the south (by the Bus Lane near Higgins Helitours), and the Humboldt River to the east. Fishmarket South is the southern portion of a larger riverside "Fishmarket" district, the northern half being occupied by neighboring Fishmarket North. Fishmarket South is presumed to have a similar past as Fishmarket North, but its original form was cleared away to make way for modern skyscrapers, whereas Fishmarket North retains much of its original character; the only reminder of the district's past is Pier 45, a converted industrial pier. The result of its design is a mix of industrial and commercial structures, with Fishmarket South's three prominent skyscrapers concentrated inland towards the west between Borlock Road and Privateer Road, and Pier 45 and industrial buildings towards the riverside in the east. Both areas are divided by Union Drive East, which elevated half to the north (running over Privateer Road) descends into the at-grade half toward the south in the district. Fishmarket South posesses a noteworthy selection of businesses and landmarks. These include: The Higgins Helitours helipad, a bus terminal, Pier 45, the Broker Bridge pedestrian access, and a FDLC fire station. The area offers spectacular views of the Broker Bridge as it climbs up from its source in neighbouring Chinatown and crosses over above the Humboldt River from Fishmarket South. Located directly underneath the bridge is the Liberty City waste management depot. This is where Liberty City's fleet of Trashmaster dust-carts are stored when not on trash collection duties. A skate park is also situated underneath the rising span of the Broker Bridge between Borlock Road and Privateer Road. The presence of Pier 45 and skyscrapers, as well as their position close to the Broker Bridge implies the district is an amalgamation of the historical South Street Seaport and the southeastern waterfront of the Financial District in Manhattan, New York City. Pier 45 and the district's the three skyscrapers are evidently based on real-life counterparts in their respectable locales, albeit scaled down to an extent. Pier 17, depicted in game as Pier 45. 2 New York Plaza, neighbour the 1 New York Plaza lookalike in the neighbouring Exchange. 55 Water Street. The game's rendition features a similar facade, but the window clusters are narrower, and the general appearance of the building and color appears to be more modernized. The game's rendition also neighbors the 2 New York Plaza lookalike, similar to 55 Water Street's proximity to 2 New York Plaza. 1 Financial Square. The in-game rendition houses an FDLC station, which spawns a Fire Truck at Privateer Road. 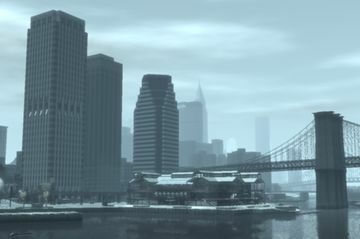 Downtown Manhattan Heliport, depicted in game as the helipad in used by Higgins Helitours, although the terminal building is completely different. Like Fishmarket North, Fishmarket South has no direct connection to any subway station in the city. The closest stations is Emerald on the Algonquin Outer Line in Chinatown, northwest from Fishmarket South, and Castle Gardens LTA, also along the Algonquin Outer Line, in neighboring Castle Gardens. The district is also well connected to Union Drive East, which transfers onto an at-grade roadway at the border with Castle Gardens, allowing the player to access the highway easier. Fishmarket South is also linked to the Broker Bridge via a stairway from the waterfront in the northern edge of Fishmarket South off Privateer Road. The stairs leads the bridge's pedestrian walkway, which eventually ends at a stairway to Hove Beach, Broker. The aforementioned Higgins Helitours helipad is also situated at the southern border with Castle Gardens, allowing the player to take helicopter tours around the city. The Fishmarket South half of Privateer Road, as viewed to the south. The road is overshadowed by the wider, elevated Union Drive East highway. The Fishmarket South skate park underneath the rising span of Broker Bridge. This page was last modified on 28 April 2012, at 22:31.